Mission Architect allows you to create your own adventures and share those adventures with every other hero or villain in Paragon City and the Rogue Isles. While others play your adventure, they gain knowledge, experience and rewards equivalent to those outside of the virtual world of Architect Entertainment. Once the players are through with your story, they have the opportunity to rate the experience from 1 - 5 stars. The higher your story is rated by other players, the more rewards you'll earn. 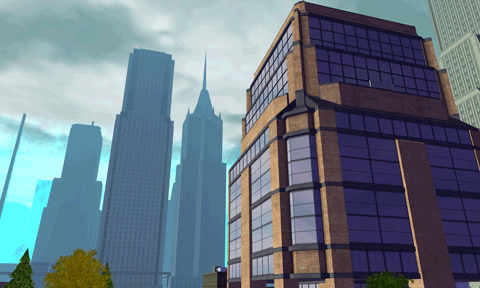 Architect Entertainment buildings are located in Atlas Park, Galaxy City, King Row, Steel Canyon, Skyway City, Faultline, Talos Island, Independence Port, Founder Falls, Brickstown, Peregrine Island, Mercy Island, Port Oakes, Cap Au Diable, Sharkhead Isle, Nerva Archipelago, St. Martial, and the Rikiti War Zone. You can create stories at any of our Architect Entertainment facilities spread throughout Paragon City and the Rogue Isles. Every facility has a host of Mission Architect Computers located either in the Main Studio or in our 'no powers' Studio B. Local Stories are stories you're currently working on or that you don't want to share with the world at large. You can have as many local stories as you want. While working on your Local Story, you can test it as if you were actually playing the missions. You can even have a team of up to seven other heroes and villains accompany you. While testing no one gains experience, earns tickets or any other type or reward except for 'Testing' specific badges. You can publish up to three stories and share them with others. Each story can have up to five missions and each mission can have up to 25 goals. When a story is published others are able to see it, play it and rate it. The better rated your story becomes the more tickets you'll earn. You can play the stories created by other players through the Mission Browser on the Architect Computer. The Browser offers a number of sorting options and filters to help get to the stories you want to play. While playing these player-made adventures, you'll earn equivalent experience as you would outside of Mission Architect. You'll also earn Tickets that you can take to a Ticket Vendor and redeem for other rewards, including unlockable content within Architect. When you're through with the adventure you'll be able to rate the story and leave a comment for the author. © 2012 NC Interactive, Inc. All rights reserved.